Each section includes up to six chapters detailing the division topic. The chapters are loaded with practical information, the writing is clear and well-edited, and the writers all convey their great enthusiasm for SuperCollider and its possibilities. I've been absorbed by the book since I got it. I haven't read everything in it yet - it's a big book, and I'm bouncing between it and various Web-based materials - but I've read enough of it to offer an opinion or two. With regards to my summary judgement, I'll just skip to the spoiler and tell my readers that this book is a must-have for any SuperCollider user and highly recommended as a general resource for anyone interesting in computer music programming and production. This book is definitely not a SuperCollider For Dummies. If you know absolutely nothing about the language I suggest reading first the Wikipedia page on SuperCollider to get a sense of the language design and some of its typical purposes. With that information in mind, new users should begin the book by reading the Beginner's Tutorial by David Cottle. Follow his recommendations (i.e. install, configure, start, and use SuperCollider), then read and follow the whole tutorial again. It has a few OSX-specific parts Linux users can safely ignore, and his presentation sails along briskly, but the chapter is an excellent general introduction to SuperCollider. It's a hands-on tutorial, and though you might not understand completely how or why things work you will have seen and heard a small sample of SuperCollider's power and how to use it. When you're familiar with the tutorial's level of material you can travel to the chapters that interest you. The Advanced Tutorials section is not absolutely required reading for the later non-tutorial material, but it is a wonderful introduction to some unique aspects of programming with SuperCollider. 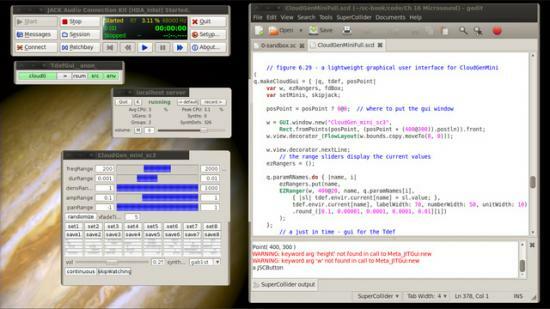 Users coming from other audio programming environments will want to read the advanced material - SuperCollider does not resemble a MusicN-derived language, and it presents a new way of considering sound composition using the computer. GUI capabilities get extensive treatment, though only for the Mac Cocoa and the Java-based SwingOSC toolkits. The Qt views described in my article are available only in the yet-unreleased version 3.5, while the book assumes a version of SuperCollider no later than the 3.4 series, the current official release. External device I/O - including MIDI - is covered in Chapter 4, a must-read if you want to explore SuperCollider's connectivity capabilities. Linux users will want to read Chapter 12, a guide to installing and configuring SuperCollider for Linux and Linux for SuperCollider. Finally, a section on development topics rounds out the main portion of the compendium. 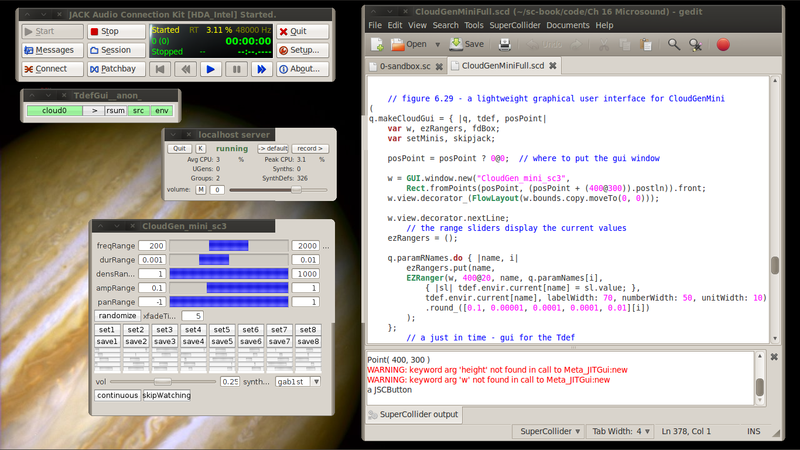 After-material includes a summary of SuperCollider's language syntax and indices for Subject topics and Code elements. In all, 750+ pages to take you on a Grand Tour of the SuperCollider universe. The book is wonderful, but would I give it to a complete newbie ? Yes, with a caveat or two. In my opinion, an absolute beginner will need some additional help at the outset, and other users may find the pace of the tutorials somewhat exhilarating. It certainly helps to have some previous experience with the principles of object-oriented coding, but SuperCollider poses no extraordinary difficulties for a novice user/programmer. The language basics are not difficult to learn, ample documentation is at hand, and example code abounds. Many SuperCollider gurus and wizards are available on the mail-lists and wiki, so if you're truly stuck you can usually find someone in the community who knows how to get you unstuck. A few more words regarding the example code: Shortly after I purchased The SuperCollider Book I bought Curtis Roads' Microsound, an extensive journey through the new sonic potential of sound conceived at the granular level. In the SuperColllider Book composer/developer Alberto de Campo has distilled some of Microsound's essential aspects in his chapter in the book's Practical Applications section, including the code for a mini-version of Mr. Roads' wonderful Cloud Generator program. The mini-generator (Figure 1) runs beautifully on my systems, and the inclusion of the SuperCollider source code makes it easy to add more capabilities to the program, e.g. new SynthDefs for the audio grains. Very cool, very musical software, a superb demonstration of the system's power and versatility. By the way, owners of the book might like to know about the Errata page. Be sure to read it. All efforts were made to ensure accuracy, but I know that it's nearly impossible to eliminate every error in a book of this size. With a list price of $45(US) The SuperCollider Book is a great bargain, but I do have a few minor complaints. At first, I was disappointed that no CD or DVD came with the book. I suspect its absence lowers the cost of the tome - which typically sells for less than its retail list price - but some impressive audio examples would have made a good selling point. As I noted earlier, some of the information is regrettably outdated, an unavoidable problem with hardcopy publication. I'm also disappointed by some of the printing decisions made by the MIT Press, decisions not made by the authors, I hasten to add. Fortunately, the Errata page linked above is on-line and open for business, and the SourceForge SuperCollider site is well-maintained with up-to-date instructions and advice for users new and not-so-new. Sustained applause for the creators of The SuperCollider Book and for the community it represents. Consider book and community highly recommended. See my main article for updated instructions regarding source code retrieval and build details.